I’ve been back in Australia a few days now and I’m still trying to find the right words to describe my recent visit to Viet Nam. 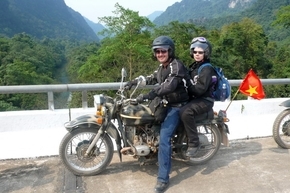 Inspired by the Ewan MacGregor-Charley Boorman Adventure, “Long Way Round”, my boyfriend and I decided to embark in our own challenge, joining Rally Indochina in the world’s first charity ride through Viet Nam on Soviet era Russian Ural motorcycles. Although dubbed a “rally” this was more officially a “motorcycle tour”, travelling each day on the old Urals in an organised convoy. Riding over 1500km from Ha Noi in the north, following the Ho Chi Minh Trail south, and finishing the ride in Hoi An (leaving the bikes at Hue and flying down to Saigon to finally finish the trip), this was not going to be a ride for the inexperienced rider… or pillion for that matter. My personal challenge was weather my arse could endure the long 10 hour riding days on the back of a rugged 1970s bike. My boyfriend’s challenge was if he could keep us alive riding through chaotic Vietnamese traffic! Joined by 21 other like-minded people from all over the world (including Australia, Viet Nam, USA, UK, Phillipines and Sweden), we set off on the 13th April from Ha Noi in North Viet Nam. The ride was amazing. Riding through small rural villages, we were greeted on the road by endless waves, smiles and ‘high fives’ from excited children. Being on a motorbike also meant that we got to directly experience the changes in the weather, the smells from shops on the side of the road, and at times ride side by side with the locals on scooters which were often laiden with livestock strapped to their luggage rack on the back. Our tour leaders, Australians Digby, Glenn and Mark were amazing guys with years of knowledge having been living in Viet Nam for many years.They provided us with information and pointed us in the right direction each day for the ride. Our main mechanic, Cuong, can’t be praised highly enough. This was the guy who also assisted the Top Gear crew for their “Viet Nam Special” a few years ago. Cuong fixed our old Ural on the last day’s ride, when we damaged the piston and required a quick ‘side of the road’ repair, all done within the hour. I dubbed him with the “MacGyver Award” after seeing him pull the bike apart with little more than a hammer, a stone, a socket wrench and a rubber band. Linh, Phu, Vinh and Queyen were also part of our support crew, assisting with our luggage in a van so we didn’t have to stow it on the bikes. Vinh, riding a Ural with sidecar, was knighted the “Steve McQueen Award” after tipping the sidecar on an embankment then doing a barrel roll off the bike over a barbed wire fence – only to watch the bike and sidecar career in front of an oncoming Police car! The timing couldn’t have been more perfect. One of the main reasons for Rally Indochina was to raise funds for the Blue Dragon Children’s Foundation, an organisation that helps Vietnamese street kids and rescues children from child trafficking. In association with Intrepid Foundation, the group raised an incredible $43,200 for Blue Dragon, which was equivalent to their annual budget. We met inspiring Blue Dragon Founder, Michael, on several occasions throughout the ride and got to visit two of the Blue Dragon centres. It was wonderful to officially hand over the ‘big cheque’ (literally!) at Hoi An and know that the money would be gratefully used by the foundation. A truly great cause! It really was one of the best adventures I have ever had. Thanks to everyone who made Rally Indochina 2011 possible. Special thanks to Diggers, Glennoi, Mark-Mark and Cuong for giving me this opportunity to explore Viet Nam in such a unique way.